As the Online Editor for the Harvard National Security Journal, I am the go-to person for many of the Journal’s technical questions. This semester I was able to put my technical skills to use by implementing a new tool that uses the Perma API. The National Security Journal’s fall issue (out now!) contains several hundred weblinks. We wanted to use Perma so that the content at those links would be permanently accessible. But we did not want to manually create Perma archives for hundreds of URLs, which could take some time. On a hunch, I suspected that Perma might have an API that would enable us to programmatically generate these links. It turned out that not only did Perma have an API, but it was surprisingly simple to setup and use. In just a few hours, I wrote a Ruby application that could import a spreadsheet of URLs, generate Perma archives for those URLs, and output a new spreadsheet that includes the URLs for each new Perma archive. In addition to programming with the Perma API, the experience let me interact with the Perma support team. This happened when I discovered a bug: on creating a new Perma archive, our custom archive title would revert, after a few seconds, back to the default title that Perma generates when a custom title is not submitted. Luckily the Perma support team was quite responsive after I reported the bug. In fact, they resolved the problem before the Journal published our latest issue. Although I was a software engineer before coming to law school, I have not coded much in the past three years and so my programming skills were somewhat rusty. Happily, the API was very user-friendly and easily enabled our Journal to programmatically generate Perma archives. 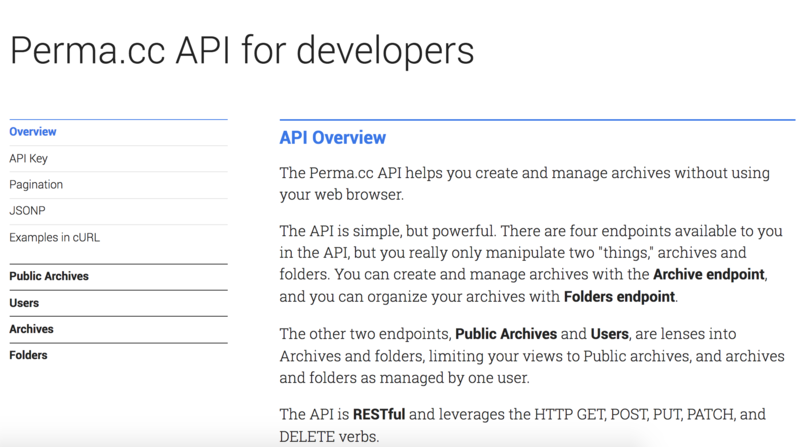 I would recommend trying the Perma API to integrate Perma archives into your publication, website, software application, or anything else that links to web-content that you want to be preserved. PS – Special thanks to Brett and Rebecca from Perma who helped fix the bug that I discovered! Aaron Marks is a third-year J.D. student at Harvard Law School. He is currently the Online Editor of the Harvard National Security Journal. Link rot is already known to be a large – and growing – issue in *court opinions*, *legal scholarship* and in many *other forms of scholarship*. With Perma.cc, we’re helping courts and scholars prevent link rot in their work. But lately we’ve seen a surge in Perma.cc usage among law firms: in the past two years, Perma.cc links have been included in over 600 cases in both state and federal court. And we’ve heard from many law firms interested in understanding how link rot affects them and how they might use Perma to tackle the problem (*newly available* to law firms and other commercial entities!). Which led us to ask: is link rot a problem for law firms? In a nutshell, the answer is yes, link rot is a significant problem for law firms, particularly in court filings and marketing materials. As the quantity and availability of online resources increase, linked citations to these materials has expanded across a wide variety of fields, including the court filings made by lawyers. These citations are key to the documents they are included in, providing vital supporting information for the arguments being made and even replacing many print resources. But the evolving nature of the internet means these sources do not retain the stability of printed material and will change over time. Broken links in court filings not only no longer support the argument or position they originally did, but also frustrate courts trying to interact with them as the information they need no longer exists. one brief contained 17 broken links. Additionally, we found evidence that link rot can be very fast-acting: all of the briefs we reviewed were filed within the last five years, with one brief – filed just months ago in May 2017, containing 12 links – had roughly 75% of those links already broken. So what can lawyers do about link rot? This review of a small sample of briefs is hardly scientific, but highlights the problem and confirms that practicing lawyers, no less than courts and legal scholars, should be taking steps to link rot. Perma.cc was devised and designed for this express purpose! Anyone can create a free account and make up to 10 Perma Links a month, and we’re now offereing a paid option for lawyers and law firms: visit our law firm signup page >here<, or shoot us an email at info@perma.cc for more information.